Myra McEntire: Bree Despain: In the Fort! Bree Despain: In the Fort! Welcome Bree Despain to The Fort! I'm proud to be publisher-mates with Bree, and glad to know her. She's always so encouraging and kind when I have questions. Plus, she's HILARIOUS. About The Lost Saint: The non-stop sequel to The Dark Divine delivers an even hotter romance and more thrilling action than Bree Despain's first novel. Grace Divine made the ultimate sacrifice to cure Daniel Kalbi. She gave her soul to the wolf to save him and lost her beloved mother. When Grace receives a haunting phone call from Jude, she knows what she must do. She must become a Hound of Heaven. Desperate to find Jude, Grace befriends Talbot - a newcomer to town who promises her that he can help her be a hero. But as the two grow closer, the wolf grows in Grace, and her relationship with Daniel begins to crumble. Unaware of the dark path she is walking, Grace becomes prideful in her new abilities - not realizing that an old enemy has returned and deadly trap is about to be sprung. Readers, ravenous for more Grace and Daniel, will be itching to sink their teeth into The Lost Saint. About Bree: Bree Despain rediscovered her childhood love for creating stories when she took a semester off college to write and direct plays for at-risk, inner-city teens from Philadelphia and New York. She currently lives in Salt Lake City, Utah with her husband, two young sons, and her beloved TiVo. You can visit her online at www.breedespain.com. Can I declare giving each other pedicures a game? We could compete for who can paint the cutest pictures on our big toes, or who gives the best foot massage. Flannel PJs all the way. Fluffy socks. I'm addicted to them. I so can't write if my feet are cold. The caramel apple cider at the cafe in Borders. I write there once a week with a couple of authors and I always get one as my weekly writing treat. No ghost stories. I might write paranormal books but ghost stories scare the crap out of me. My sixth grade teacher used to read to us (in the dark) from "Scarry Stories To Tell In The Dark" and it seriously freaked me out. One night I became convinced that there was a ghost under my sister's bed (or perhaps it was home to an inter-dimensional portal). I don't know what was going on, butsomething was definitely putting off an eerie glow from under her bed. I tried to ask her if she knew what was causing the light, but she got really mad because she thought I was trying to scare her on purpose, and refused to look under her bed. To this day, I swear there was an unexplained light there. Truth. Unless I've had a few Mountain Dews, then I'd go for a dare. Damon Salvatore. 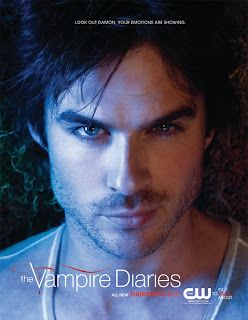 Because I can't get enough of his smoldering "eye thing." Also, Tim Riggins from FNL...because that boy needs some love. Awake all the night. The funniest stuff happens when people are sleep deprived. I'd watch the antics but I wouldn't be the instigator. I'm good at being an egger-oner. I said it the last time I was in The Fort, but I think I'll always choose Meg Cabot. She's my idol, and she seems like she'd be perfect sleep-over company. That's one entertaining lady. I'd want her to read to us from her new book, ABANDON, that doesn't come out until this summer. Thanks for visiting The Fort, Bree! Look for a contest post going up soon! I love NEVER BEEN KISSED. Fabulous movie! I thought Bree rocked before I saw who she picked for the fort mascot. Now I think she's the bomb! ;) Great interview ladies! Too much fun! I think Bree and I could be buddies--team Damon and Riggins! Love it!